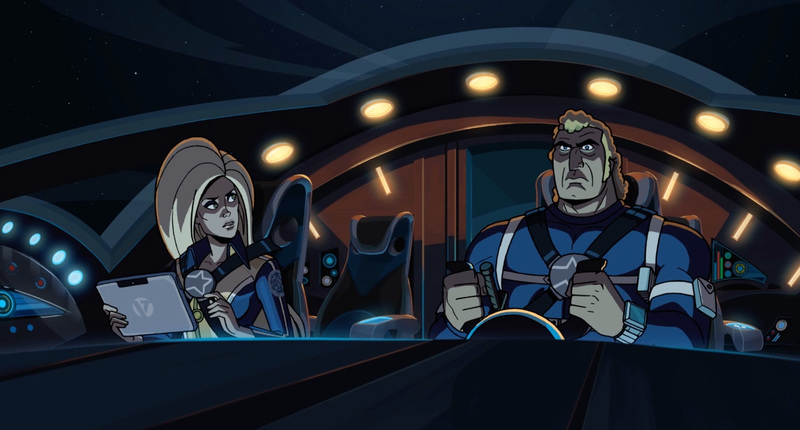 These are pretty much everywhere now, but if you love this site most of all for Venture Bros. news and information (and I know you do), click through to check out some screen grabs from the upcoming episode, which is with all certainty titled "All This and Gargantua-2". Watch the special episode on Adult Swim this Monday night at midnight Eastern/Pacific time. Technically Tuesday for those timezones, but you know the drill. Oh man, and Dr. O as well?! That is so great! Who isn't going to be in this episode? The teaser said Brick Frog specifically won't be in it...but I haven't seen any shots of Hatred, I wonder where he's at? and Brock will get stuck as a bodyguard for the Venture's again. He's bald by the end and has dark bags under his eyes. Spoilery guess... I'm calling it... Jonas got cancer from space rays. Any thoughts might what happen to Hatred? Brock returning as Venture's body guard?! AWESOME! How do u know these things will happen? Is Shoreleave and Hunter going to be in this? I know Tresiter is in it after JJ & Billy fixed his cancer issue. I'm wondering if the aliens actually did "fix" him, and now JJ wants a cure. Maybe the sovereign is an alien too. That spaceship at the end looked very much like a guild craft. I mean, wild speculation aside, this is going to be a game changer, you can just tell by the previews. Everything I've written is rampant wild speculation... but it will be fun to see what I get right. Do u think Brock may hook up with Amber since Mol is old news. It's been implied that they've been hooking up somewhat regularly. I think in Bot Seeks Bot maybe but my season 5 knowledge is way worse than the rest of the show. All right! So Brock f@cked her! What of it?!? I've got the popcorn popping and the VCR set for stun! Better 'solo a mano', eh? Ign gives the special a 9.6/10 overall. They shower it with mad praise! Ahhh it sounds amazing. Can't wait! Yeah, spoilers about a few big things, both guest voice and plotwise. Very excited about most of it. No clue why they can't wait to put up a review until after it airs. Don't understand why anyone who is invested in VB would read the review before seeing the special. I don't know- I think the one at the end is pretty huge for some fans. It's all spoilery, all the advanced stuff... but I assumed all of what's now officially revealed anyway. So many more answers still await... Vestiny awaits us all! Am I the only one who noticed that Scott Hall (AKA Henchman #1 or Zero) was robbing the Casino with Werner Ünderbheit? He's part of the Revenge Society! That kicks all kinds of assess! No, I caught that as well! Couldn't make out what insult he gave Brock but that smart-asstic tone in his voice was very Scott Hall my ears! "Don't talk to that OSI scum." There's more like "no number" along with that.. Yes, that was the spoiler I was talking about. +Rusty inadvertently becomes a real villain, Malcom becomes a real hero. +A bunch of characters die, like Prof. Impossible and Steppenwolf... but even bigger characters die too. +Something insanely crazy happens to Brock! +After 12 years.. something in the special will have enough emotional weight to it... that it will make me cry.. and I never cry. The entire show changes... forever. What do u mean "Something insanely crazy happens to Brock!"? He's not going to get killed is he? !